I must confess that my bookshelves are rather a jumbled mess. Over the years, I have made half-hearted attempts to categorise them in alphabetical order, colour, genre, etc. but they never stay that way for long. 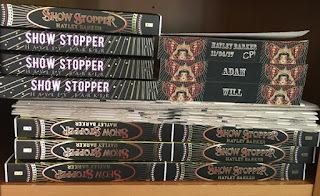 I think the books must get up in the night, have a bit of a party and then collapse in an exhausted muddle when day breaks; it's the only reasonable explanation I can think of. I can't truly be cross with them for this because it's exactly how I like them and it's the way they will stay. The bookshelves reflect me. They reflect my inability to maintain a tidy home despite my continued desperate efforts, and they reflect my reading habits and my tastes in literature. On my shelves, contemporary YA snuggles down with the Brontës, and with travel guides and books on raising children and William Wordsworth and Sylvia Plath. 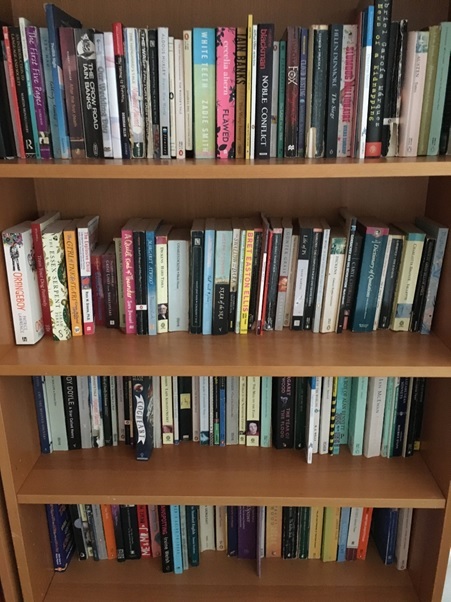 The shelves are currently enjoying a bit of a rejuvenation.I flirted with the Kindle for a few years but I have found that I retain less memory of books when I can’t hold a physical copy in my hands. I forget the title, I forget the author, I forget what happened in the story in a way I never do with hard copies. And so, I have gone back to my first love: real books, with real pages you can lose yourself in. 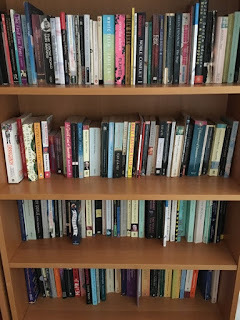 I rarely re-read books – there are just too many wonderful new ones to read- but I do like to go in and peruse the shelves, then pull one out and flick though its pages again. Because of this, I find it very hard to get rid of books when there’s no space left to store the new ones I buy and I am forced to have a reluctant clear out. What ones are the most special? There are two. The first is this one: The Complete Works of Shakespeare, which was my Granny’s. 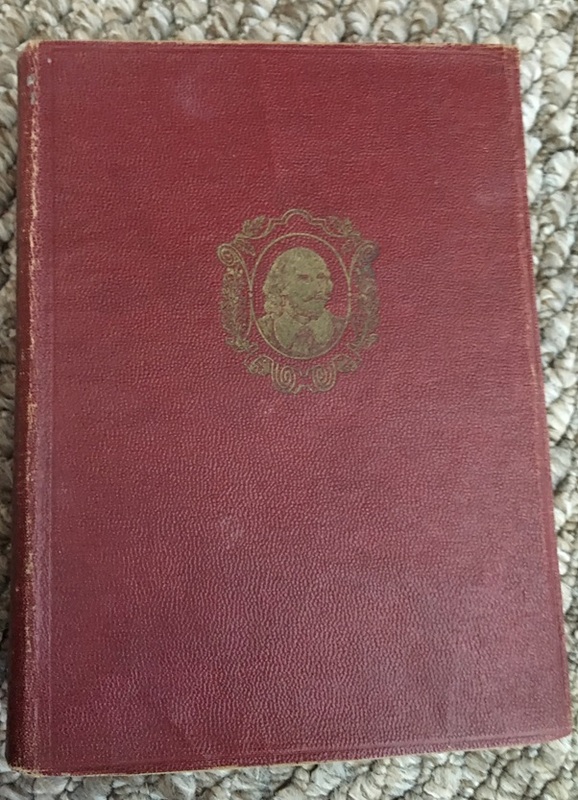 She was given it when she was a girl by her older sister, and she gave it to me when I went to read English at university. She died nearly six years ago now, so she never got to see me become a published author. I think she’d be proud though, and I know she’d show off about it. 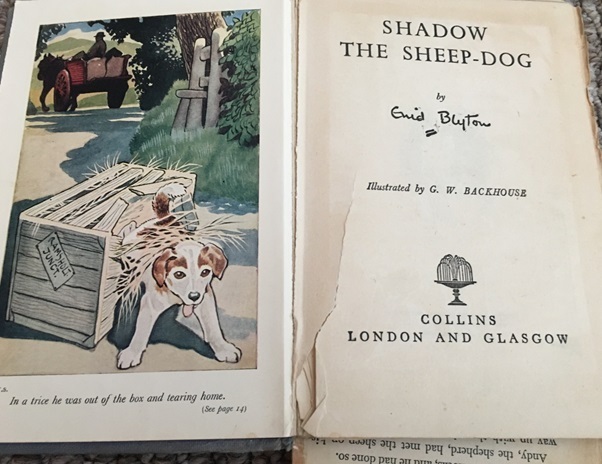 The second book of sentimental value is Shadow the Sheep Dog, by Enid Blyton. This was my Dad’s copy when he was a boy, and it was always his favourite book. Both my parents read it to me when I was young and I’ve tried to read it to my own children twice now, but it’s never the same as my nostalgia wants it to be. 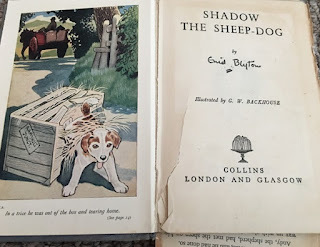 The physical ways in which dogs were trained on Blyton’s farm of the 1930s was very different to the ways modern dog trainers advocate and there are lot other tricky points in the book which my own morals and sense of political correctness find hard to overlook. Still, I love the way it feels when I hold it in my hands, and the way the pages are so soft now. Finally, I have recently made space for some new books, all on a shelf of their own. 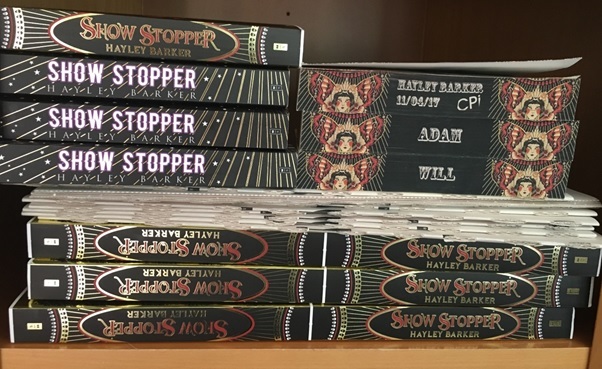 My publishers arranged for me to go and watch the first editions of Show Stopper come off the press and the printers, CPI Limited, gave me a wonderful goody bag to take home. I have copies of the book in its various stages of production, and personalised, dated copies for me and both of my sons. These are so special and they take pride of place on the shelf, along with the very first proofs of the book. Every time I look at them all nestling there (and it is rather a lot) it makes me go all warm and tingly. My own book on my own book shelves: it really is a dream come true.